Poll finds religious Zionist voters prefer National Union head Bezalel Smotrich to lead joint list with Jewish Home and Otzma Yehudit. 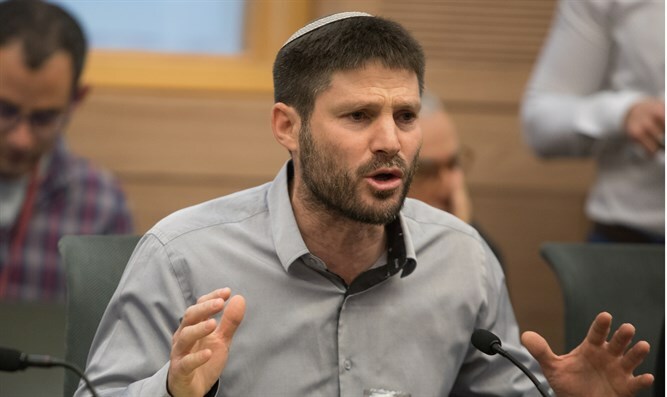 A new poll conducted by the Midgam agency shows that the chairman of the National Union, MK Bezalel Smotrich, is the preferred candidate of the religious Zionist public for the chairmanship of the united list of the Jewish Home, National Union and Otzma Yehudit. The survey examined a number of candidates: MK Smotrich, Rabbi Rafi Peretz, the mayor of Sderot, Alon Davidi, and the mayor of Givat Shmuel, Yossi Barudani. One-third of the respondents said they would vote for the united list if Smotrich leads it, 24.3% will vote if Peretz heads it, 13.0% will vote for the list if Rodney leads it and 10.7% will vote for it if Davidi leads it. Assuming that only the National Union and the Jewish House will run on a joint list, Smotrich receives support from 11.8% of voters, Rabbi Peretz with 8.6%, Davidi wins 5% support, and Rodani receives 4.9%. The survey appeared to dispel concerns that Smotrich is pushing away more moderate religious Zionist voters. The poll, commissioned by the National Union party, shows that 22.7% would not vote if Rabbi Rafi Peretz, who is considered a member of the National Religious Party, will head it. Only 8.9% percent said they would not vote for the party if Smotrich heads it.